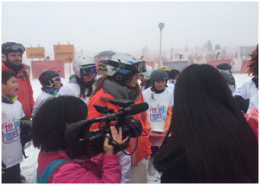 On January 15, to support 2017 World Snow Day Chengdu Xiling Snow Mountain ski resort held a lot of activities with the participation of 50 kids and 5 foreign ski coaches in total. We aim to provide kids with quality safety knowledge and technical guidance. Through this meaningful and special activity, kids get a great opportunity to communicate with foreign ski instructors which helps them acquire professional ski knowledge, as well as English communication skills. To reach a better publicity effect, we invited Sichuan TV, Chengdu TV too, city news, Dayi TV and other columns to the scenic spot for the event publicity. During the event, we set up a kids ski service center in ski equipment hall to provide kids with professional knowledge. In order to give the kids a vivid lesson of basic ski knowledge, each trainer did well in preparation in advance. 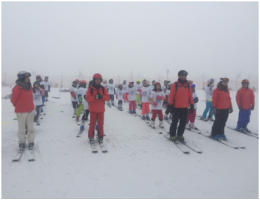 Through the lessons, the kids acquired basics of ski including ski preparation, techniques, security tips and other knowledge. 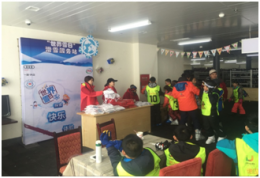 In the 2017 World Snow Day activities, Chengdu Dayi County Xiling Snow Mountain ski resort also provide kids with free tickets for the scenic spot, free rent, free ski pass, free traffic, small gifts and prizes, and free teaching service.